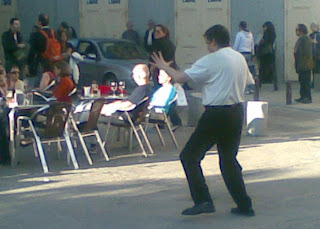 He "performs" a lot in Plaza Santa Ana, which is right near the studio. He's pretty awesome. He only has 4 or 5 moves, but he strings them together nicely and repeats them over and over until the song is done. And then does it again for the next song. It's usually Michael Jackson. What can I say, he brings me joy too. Right now I wish I could do those moves. Just don't quite have them down yet. But trust me, he's right up there with Indian Superman.